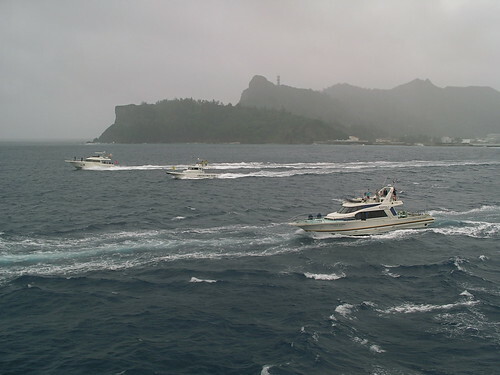 This is the fifth post in a series about a trip last year to the Ogasawara Islands. The introduction is here, and click here for the previous post. 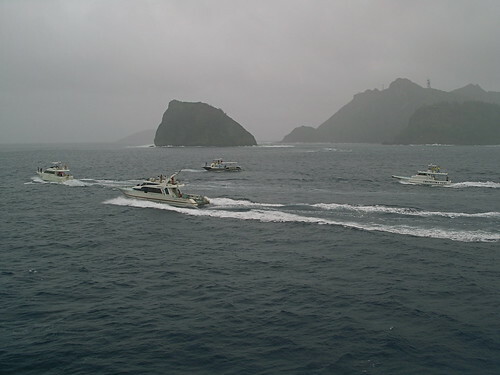 On my second morning on Hahajima, the smaller of Ogasawara's two main islands, I woke up early to the sound of rain. Unable to get back to sleep, I grabbed one of the hotel's loaner umbrellas and headed out for a morning walk, enjoying deserted streets and greenery made lush by the downpour. 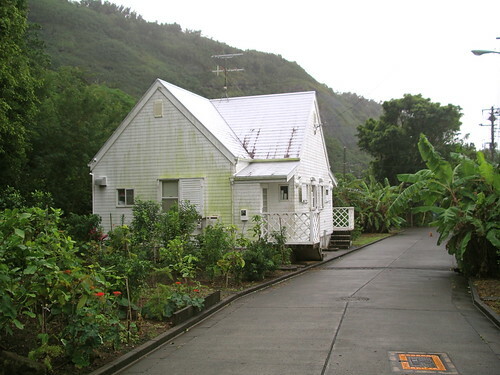 As on Chichijima, many of the houses were of a cute and vaguely western style, with no two looking the same- very much unlike homes on the mainland. 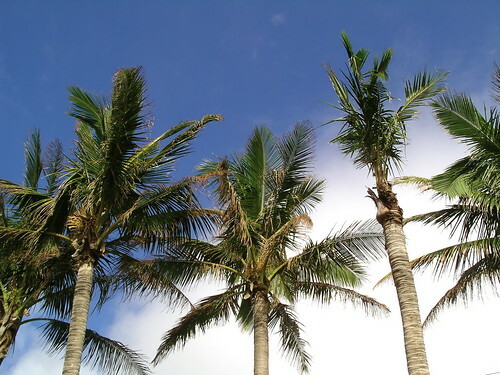 They also tended to have impressive gardens, overflowing with tropical flowers and fruit-bearing trees. 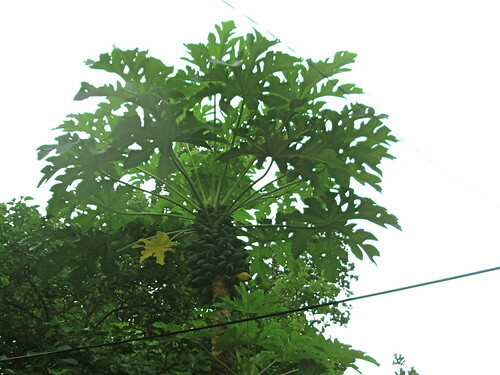 Above is a papaya tree, with a single ripe papaya ready to drop. I passed more critters than people, probably because the islanders are too sensible to go out in the rain. 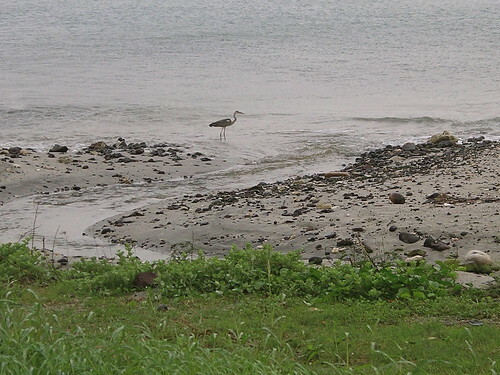 Above is an aosagi (grey heron), also commonly seen in mainland Japan. There were cats all over the place, which is apparently a big problem on the island. 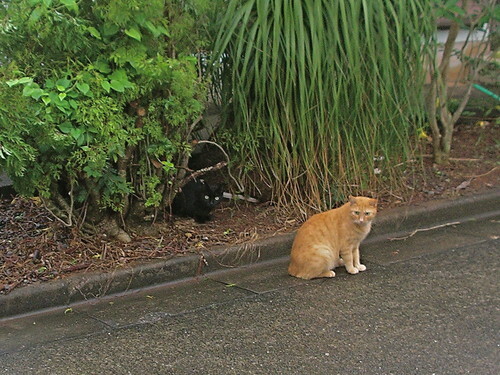 An out of control feral cat population is a huge threat to Hahajima's native Hahajima meguro (bonin white-eye) and other birds. 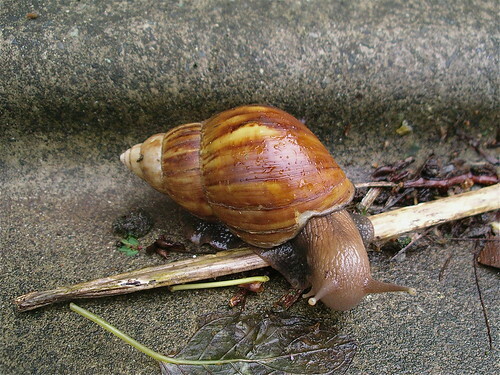 Lots of snails were out loving the weather, including this Africa maimai (East African land snail), an invasive species in Ogasawara and many other parts of the world. 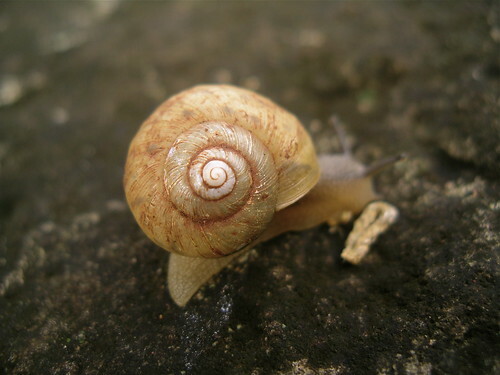 This was the first time I'd seen a live one though, as the empty shells are favourites of the local oka yadokari (land hermit crabs). 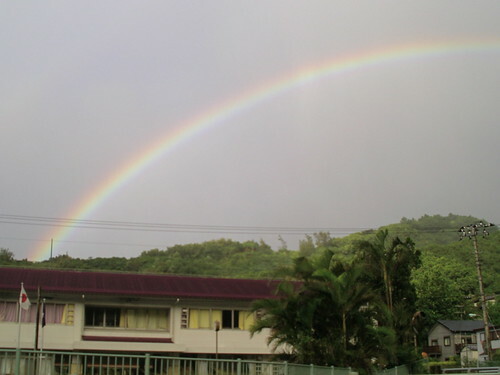 The rain stopped while I was out and I came back just in time to see a rainbow. Breakfast was at Austro, a restaurant (one of just a few on the island) attached to our hotel, Nanpu. 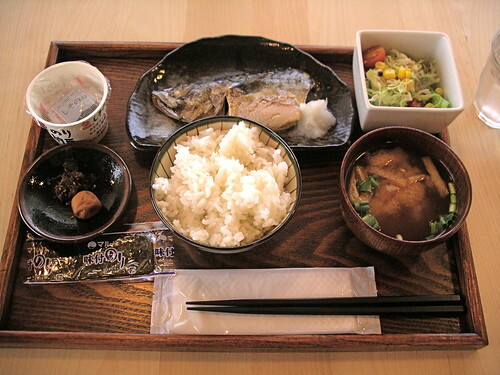 It was a classic Japanese style hotel breakfast. Clockwise from top left: natto (fermented soybeans); saba no nitsuke (salmon poached in sake and soy sauce); salad; miso soup with abura-age (fried tofu); rice; nori seaweed sheets, umeboshi (salted plum) and tsukudani (seaweed braised in soy sauce) to eat with the rice. 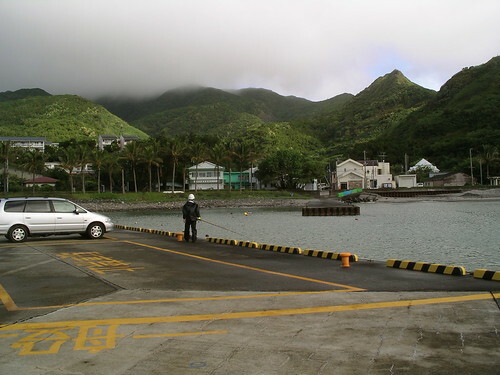 We were then brought to the ferry terminal to begin a walking tour of Oki, the little village we were in (and the only village on the island). 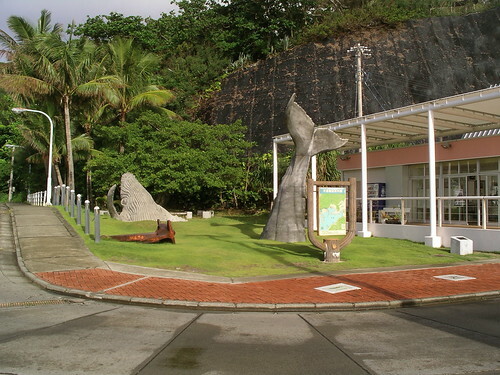 We started with the whale sculpture next to the terminal, above, then walked past . We stopped by the island's only school, which accepts elementary and junior high school students (high school students have to go to Chichijima for their schooling), one of the fanciest schools I've seen. 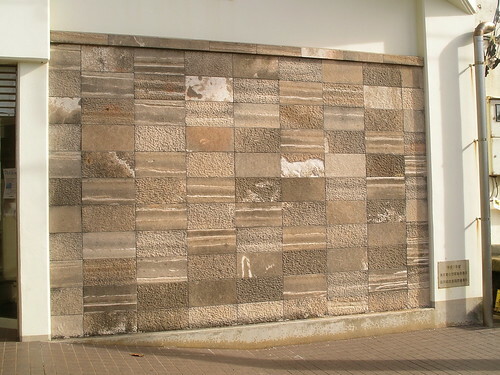 It featured an inner courtyard with actual grass (a rarity in Japan, where school yards are usually lined with dirt, sand or concrete) and decorated with the island's native Rolfs stone, above. 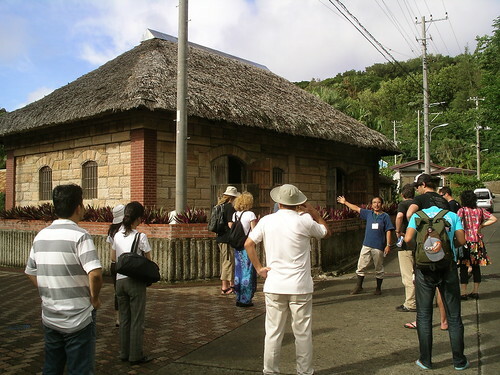 We had a brief stop at the Rolfs Museum (Ross Kinenkan, also translated as Ross Museum or Rohsu Memorial Hall), housed in a small building built of Rolfs stone in 1913. 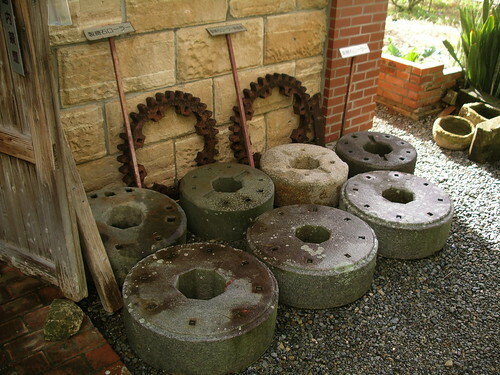 The building was originally used to store sugar, and outside the museum is equipment leftover from sugar and rum making, like the sugarcane rollers above. Everything was just laying out, exposed to the elements (and critters) with little explanation and no information in English, which I found a bit sad given Ogasawara's English language history. 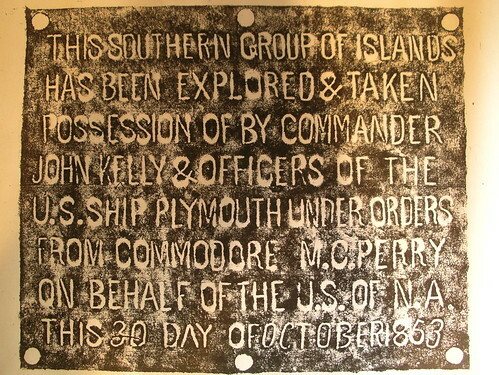 The one bit of English was in the form of a rubbing, below, from a plaque commemorating the annexation of Ogasawara by Commodore Perry, who was on his way to the mainland to demand Japan open up to the west. I would have liked to stay longer in the museum but we were taken back to the harbour to see the island's sea turtle operation. In an effort to increase the endangered sea turtle population, eggs are harvested from the island's beaches and the hatchlings raised for a few years in tanks before being released into the ocean. 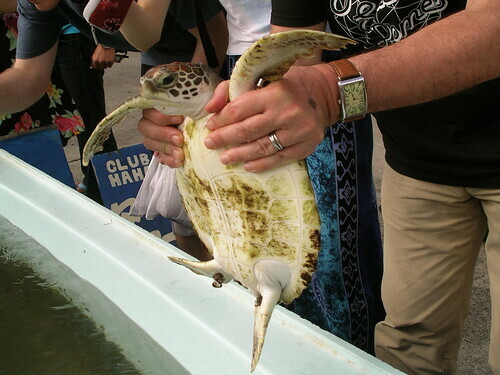 Where they are eventually caught and eaten, as sea turtle is considered a delicacy here. It would seem that a better solution to saving the turtles would be to not eat them, it is argued that the consumption of the turtles is a strong part of the island's cultural heritage and should therefore be continued. 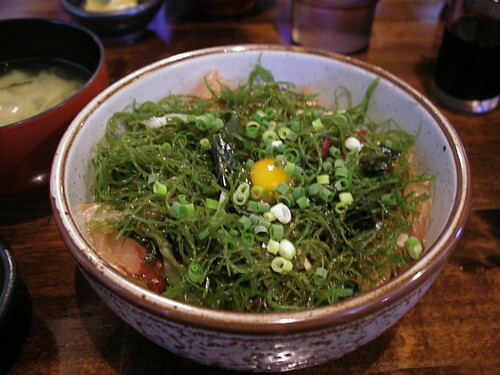 This deep cultural heritage seems to be expressed chiefly by touristy restaurants serving turtles, in the form of sashimi, soups and stews, to visitors keen to try exotic local dishes. 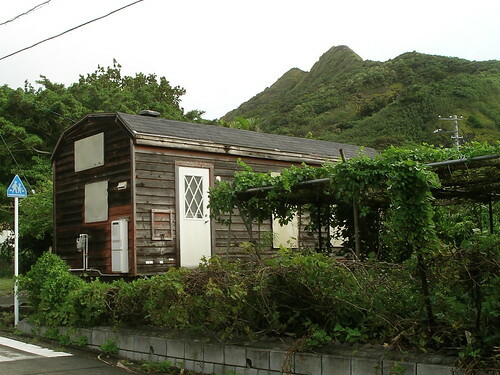 Interestingly, no turtles were consumed during the two decades when Ogasawara was occupied by America, which is said to be the only reason why any turtles remain in the waters surrounding the islands. 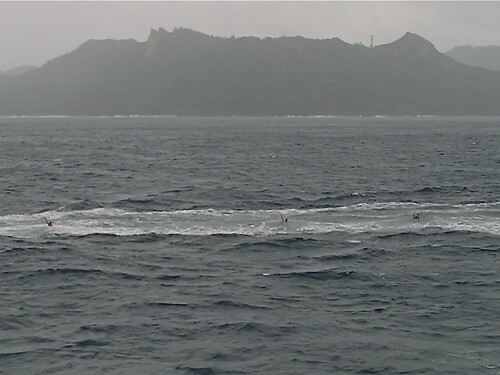 Although before the war thousands of turtles were caught each year, since the return of Ogasawara to Japan in 1968 the catch has been severely restricted. Today only one man is allowed to catch the turtles and numbers are limited to 135 per year. 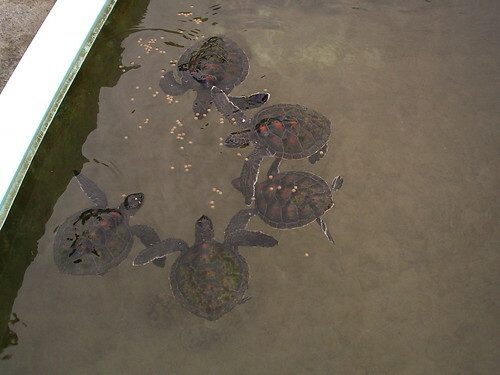 The islanders claim to be serious about increasing the turtle numbers, and the population is indeed increasing slowly. If the hunt as strictly enforced as the islanders say it is, then it seems reasonable to catch a few turtles each year, but considering the number of restaurants and inns on both Hahajima and Chichijima that serve the turtles, plus whatever is consumed in private, it seems a little hard to believe that only 135 are being taken each year. I never did get a chance to try turtle as our meals were all planned for us, so I have no idea if sea turtles taste so great that it's worth continuing the hunt. 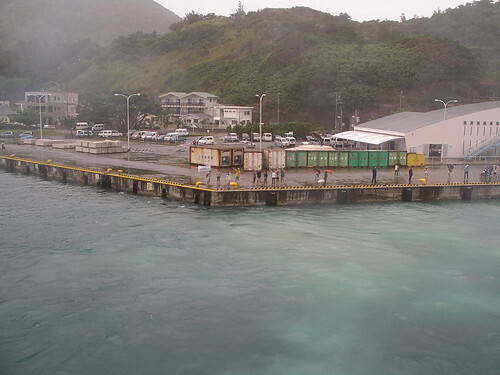 And then it was time to board the ferry back to Chichijima. 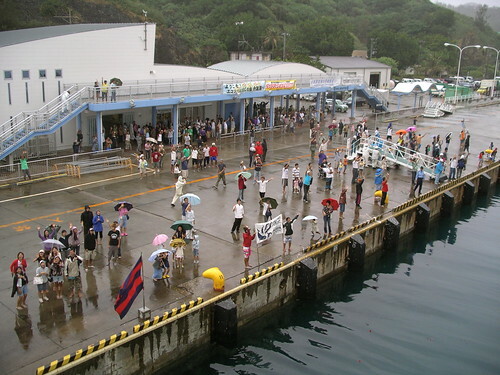 A small group of islanders came out to wave the boat off, and I assumed they were bidding farewell to friends and family leaving for Chichijima or the mainland. I wouldn't find out until later that day what they were really there for. 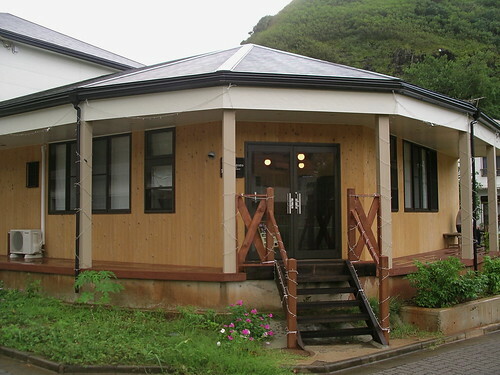 A few of us had expressed disappointment at not getting to try local cuisine, especially shimazushi, the unique sushi eaten on Ogasawara. The lady who ran one of the inns we were staying at, La Mere, was kind enough to make some and box it up for us to eat on the ferry. 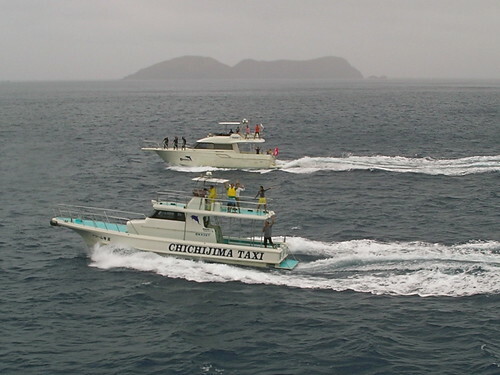 Shimazushi, literally "island sushi", is originally from Hachijojima, the southernmost of the Izu Islands (about 700 km north of Ogasawara). 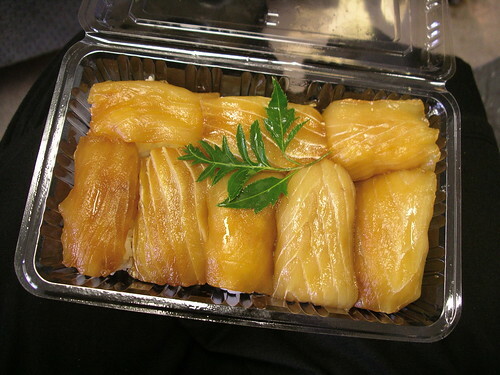 Many of Ogasawara's Japanese settlers came from Hachijojima, bringing this dish with them. 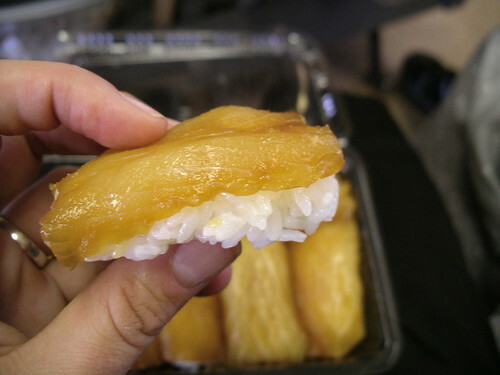 Shimazushi differs from regular sushi in that the fish is first marinated in a sweet soy sauce, and the rice is dabbed not with wasabi but with mustard. 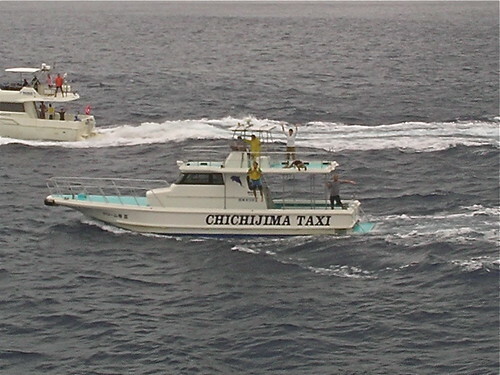 On Hachijojima several types of fish are used but the Ogasawara version uses most sawara (spanish mackerel). I was still quite full from breakfast but managed to down a few pieces, and enjoyed them more than I thought I would (I'm not a big fan of Japanese mustard so was expecting not to like shimazushi). It was definitely on the sweet side but after a few bites the fish, sugar, soy sauce and mustard flavours all balanced each other out. 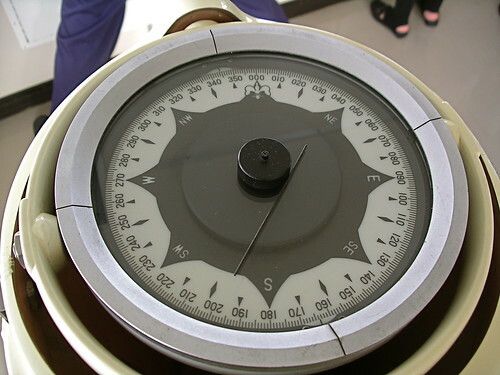 In fact I ended up feeling rather stuffed, which I soon regretted as the sea was rough and I'd taken my anti-motion sickness pills a bit too late. 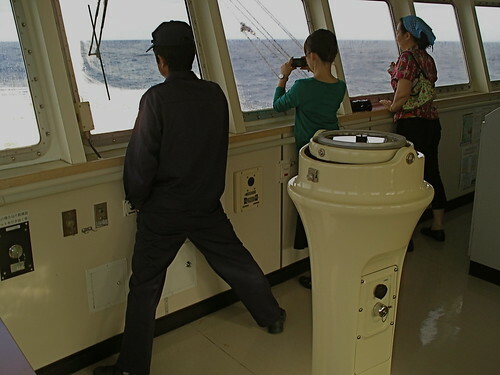 Yup, I got seasick, for the first time on the trip, and spent most of the journey in the bathroom clinging to the special vomit sink (a low, wide sink that is a far nicer place than a toilet bowl to be sick in). Once on Chichijima we were brought to a restaurant called Bonina for lunch. I probably would have enjoyed the food if I wasn't still sick, but I only managed a few bites. We were served poki-don, a Hawaiin style donburi (rice bowl) topped with sashimi, a few kinds of seaweed, and negi (long onion), flavoured with soy sauce and sesame oil and topped with a raw uzura tamago (quail's egg). Unfortunately even had I been well this would have been a miserable meal, as the waitresses were rude and the TV next to our table was on at full volume, making any conversation impossible. A very sad last meal on Ogasawara. After lunch we were brought to the ferry terminal where we said our farewells to the local guides and government folks who had been taking care of us. 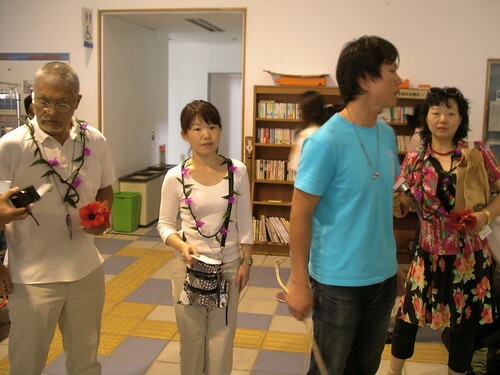 The Tokyo government people gave us some souvenirs and the ferry people gave everyone freshly made leis and red hibiscus flowers, seen above. 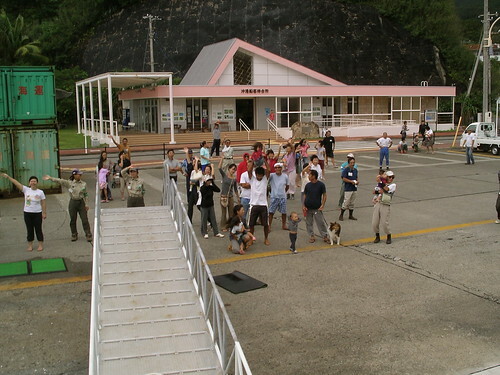 After we boarded our ferry, the Ogasawara Maru, everyone rushed to the decks so we did the same, and saw what seemed to be half of the island's population out to wave us off. Apparently they were there for us tourists, and there would have been more of them if it hadn't been raining. 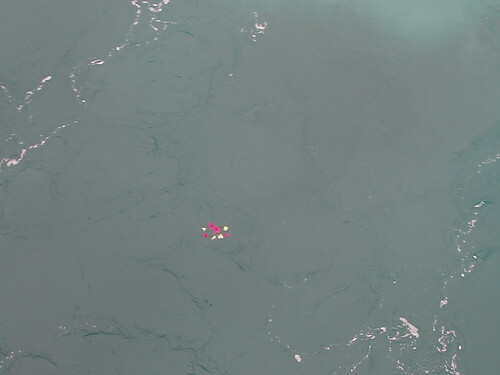 We were meant to throw our flowers and leis into the water as a prayer to return someday to the islands, which seems to be a custom borrowed from Hawaii. I was a bit distracted and ended up missing my chance, so I still have my lei. 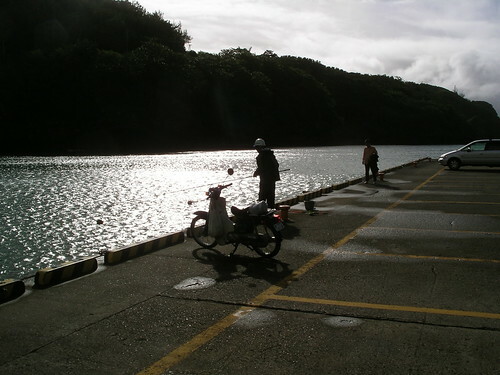 Some of the islanders stayed with the ferry as long as they could, following us along the dock by running or driving. This went on for about twenty minutes, and when we saw the last of them I was ready to head to my room and escape the rain. 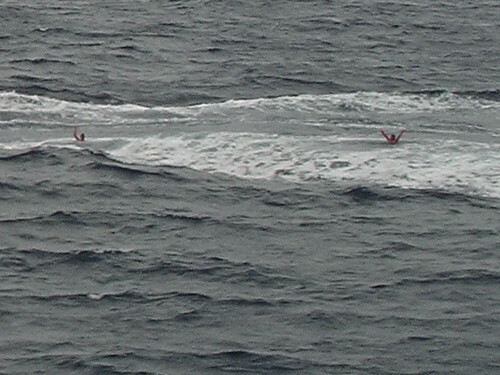 And then a small boat pulled up alongside us, its occupants waving madly. 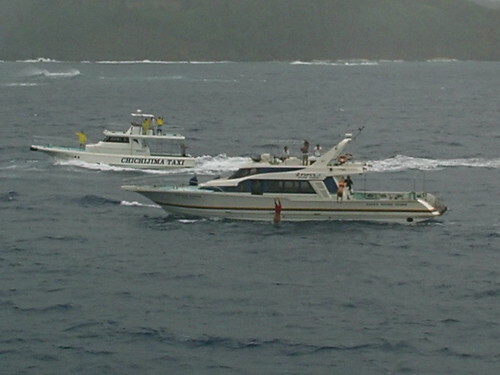 Finally there were four boats, all full of people waving at us. 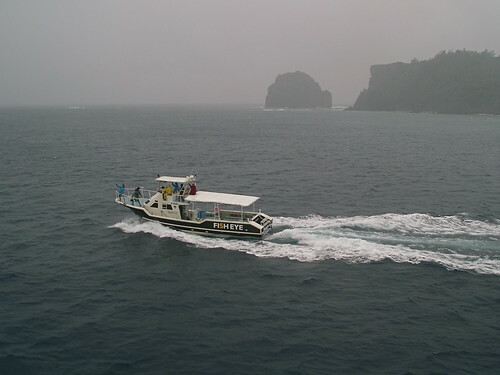 The islanders followed us right out of the harbour, and when the ferry finally started to outrun them they jumped out of their boats and waved to us from the sea. What a send-off! 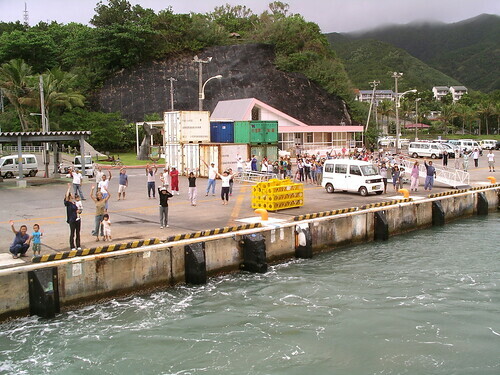 Apparently this happens every time the ferry leaves Chichijima (and Hahajima too, as we saw earlier in the day) and in good weather and peak season the farewell can get even crazier than what we saw. When we had finally lost sight of the boats everyone went inside, as the weather was getting bad. 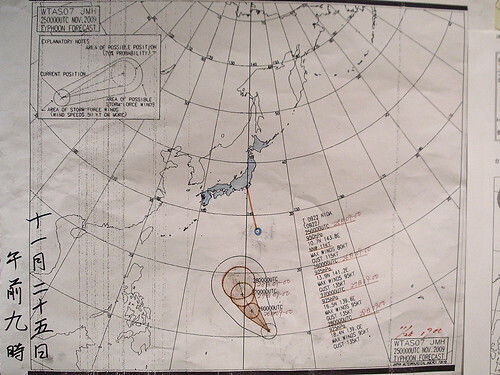 I noticed this printout that tracked the progress of a typhoon headed our way. It was a few days old but we were told that it was continuing on its predicted path and the sea would soon be getting choppy. Thankfully I had taken my meds on time, and had enough to last me the rest of the journey back to Tokyo. 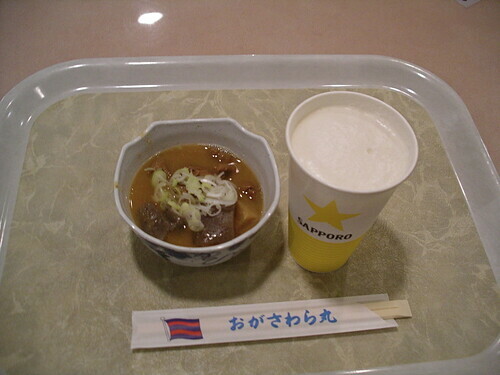 My earlier seasickness had worn off and my appetite returned, but knowing we were in for rough seas I ate a light dinner: just a bowl of motsu-ni (miso-stewed daikon and pork intestine) and a beer. 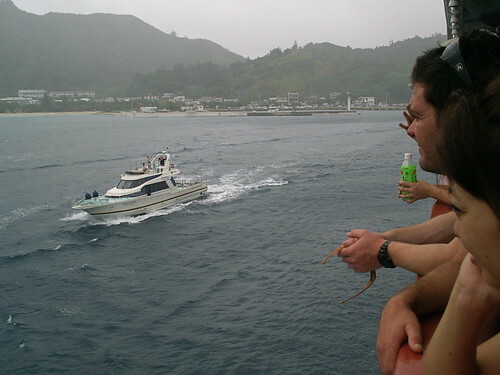 I was soon glad for my restraint as the ferry started to rock badly, and only got worse as the night wore on. We had to give up our plans to stay up late celebrating the end of our trip and instead we all headed to bed, unable to sleep from the rocking and trying hard not to tumble out of our bunks. My pills worked and I didn't quite get seasick, but it was a very unpleasant night. 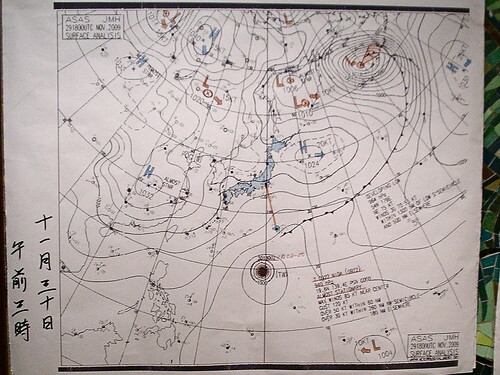 The next morning the sea had calmed down and a new chart was up, and it didn't seem like the typhoon had come close to us at all. If such a far away storm could cause such rough seas as the night before, then I'd hate to experience truly bad weather at sea. 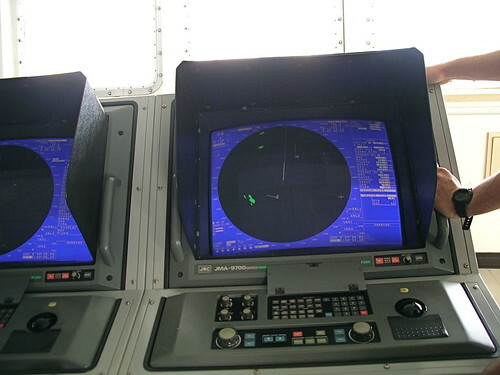 After breakfast we joined a tour of the ferry, starting far below in a room full of computers and fancy equipment. 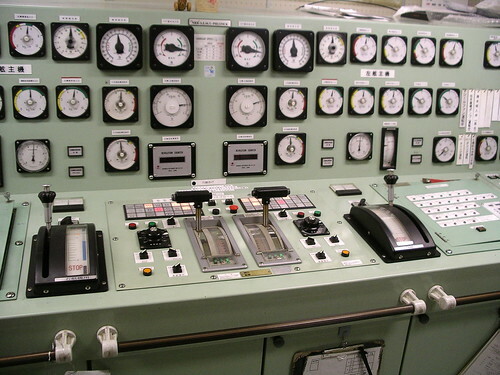 I couldn't understand a thing, but it was neat to see all the machinery that keeps the boat going. 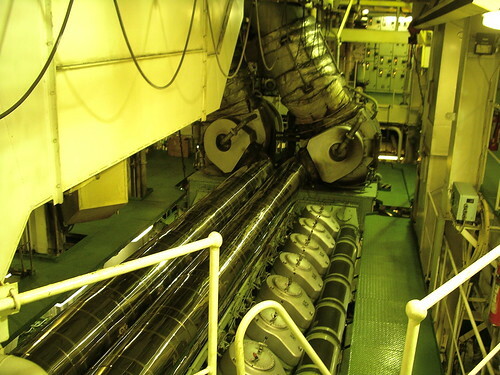 We moved on to the boiler room, which was so hot and noisy we could only stand it for a minute. 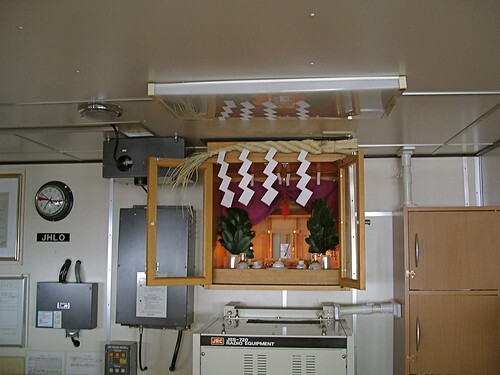 Then we were taken to the helm, where along with the sophisticated machinery there was one rather low tech piece of equipment: a shrine, where the captain and crew pray before each journey. Lunch was at the ferry's overpriced but decent restaurant. 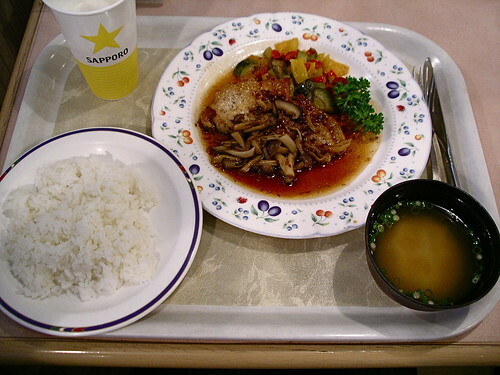 I had a pork chop sauteed with mushrooms, miso soup and rice, my first full meal since the morning before and the final meal of the trip. 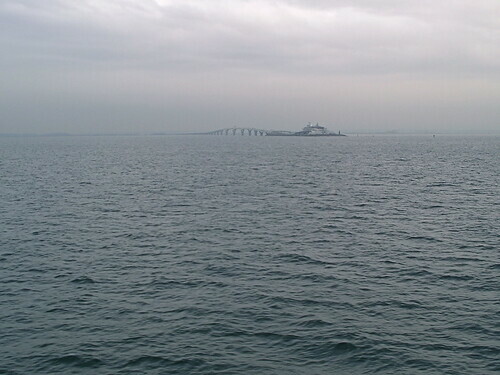 Soon after lunch we were in Tokyo Bay and while the cloudy weather prevented any good views, we did catch a glimpse of the Tokyo Bay Aqua Line, the bridge and tunnel that connects Kanagawa and Chiba prefectures, as it disappeared from the surface and tunneled under the Bay. And a few hours later we were in Tokyo. The president of Mile Post, the consulting company that had arranged the trip, was there to thank us, and after saying good-bye to everyone I headed home, sad that the trip was over but really looking forward to seeing my husband and sleeping in my own bed. 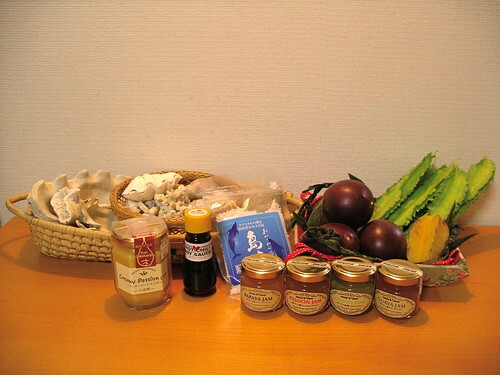 Here are some of the souvenirs I'd come home with: seashells, a jar of passion fruit curd; chili flavoured soy sauce made with island-grown chilies; locally made sea salt, papaya, passion fruit, island lemon and guava jam; a few fresh passion fruits; a star fruit; and wing beans, all specialties of the island. The soy sauce, salt and beans were a gift from the Tokyo government and the rest I'd bought- or collected- myself. The passion fruit and passion fruit curd were especially good and I wished I'd bought more, especially as I've since seen the curd (there is also lemon curd made from the local island lemon, which I also bought and was delicious) on sale at Dean and Deluca for about 1400 yen, more than double what I paid on the island). Sadly all the edibles were soon gone, but I'll always have the seashells to remind me of a wonderful trip. 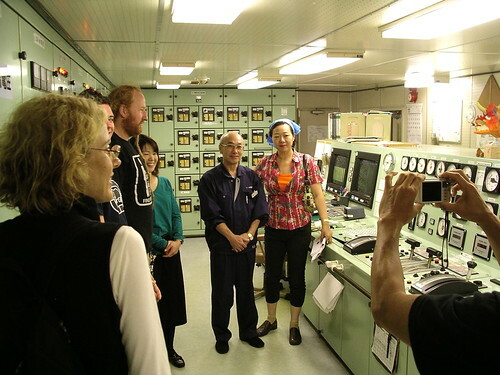 See more pictures from my last day on Hahajima here, and pictures from the ferry here. 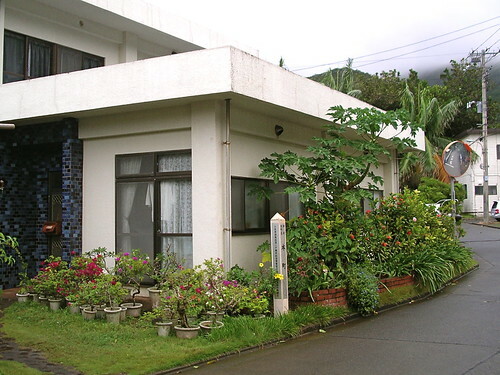 The complete Oagasawara photo album is here. Hey, I'm a huge fan of both Japan and your blog. Just wanted to say, love the pictures, the descriptions of food, and the epic send-off! To me, friendly locals and authentic indigenous cuisine almost always make a trip work. Love the sendoff. I wonder if the locals ever get tired of it, though. Have you ever tried ginger (fresh, dried, candied...) for motion sickness? It's supposed to be as effective as Dramamine. Sharon, those two factors are very important to me too. Add pretty scenery and that's all I need! Aspasia, I wondered that too. But they seemed genuinely enthusiastic, and since most of them work in the tourism industry and there's a good chance that their customers are on the ferry, I don't think they mind. 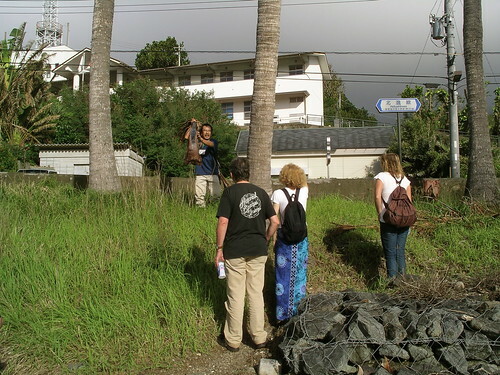 Apparently the island has a very high rate of repeat visitors, and the send-off is one reason. I've read that studies are inconclusive so have avoided trying ginger for sea sickness, because I always get sick on the water and the medication I take (not sure if it's Dramamine or not) always works (provided I get the timing right). 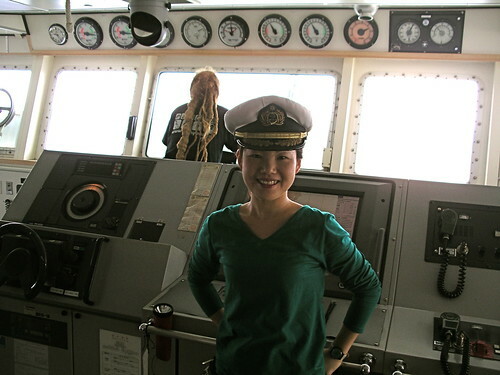 I've been on a LOT of boats and let me tell you, being seasick can absolutely ruin a trip. I just don't want to risk an alternative treatment not working. That said, when I was sick this time I REALLY wished I'd brought some ginger tea or tablets as a backup. 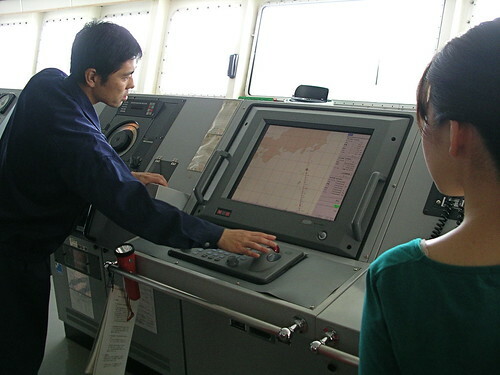 Or Seabands (which oddly aren't used in Japan). By the way, I was kind of looking forward to trying ginger as a cure for morning sickness but never got sick enough to bother.